Plan Bee Warehouse Operative, Jamie Keenan is used to life in the local spotlight as a member of leading Wishaw band, The LaFontaines. But even Jamie couldn’t predict the events of the last 24 hours following an impromptu busking session to promote the bands forthcoming gig at the Barrowlands. 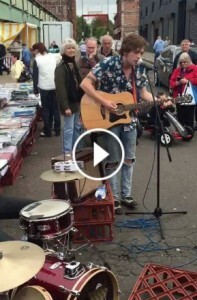 Jamie is more used to sitting behind a drum kit, but popped up as frontman with his guitar and a mic to sing a version of ‘Granny Aff The Drugs’ at the Barras Market yesterday afternoon (2pm, Sun 13th Sept, 2015). The video has since gone viral, with more than 600,000 views… and rising.